Cube Xtreme. A skill based reaction game where you must jump between different platforms to escape traps and falling off. There is two modes: practice and survival. You must beat beat up to level 18 to unlock survival mode. is a fast and fun jumping game that tests your agility! Jump the cube on the ledges before they disappear. Don’t land on any triangles! How long can you stay in the game? This game is one of the action games on Round Games. 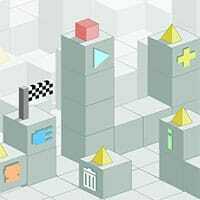 Enjoy and have fun in playing this free online game. Also Make sure to check out Mimo Game. You may enjoy playing it.